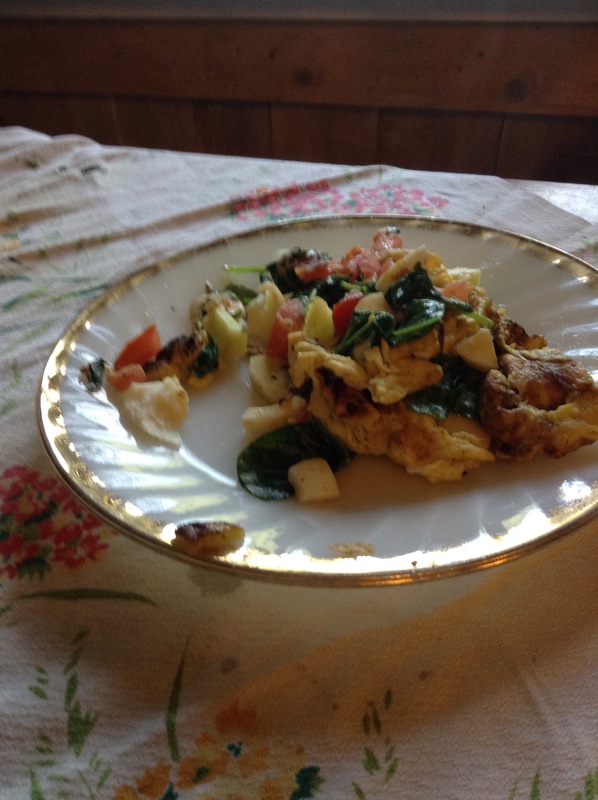 The phone rang and I have ADHD, so my omelette scorched , then plain just fell apart but you’re not here for pretty food photography, right? This is the reason I prefer to make salad with spinach than lettuce (besides that spinach has more nutritional value) .I can recycle spinach salad far easier into other foods than I can lettuce. You can throw it in wraps, pasta dishes,bake it on fish or meat… lots of possibilities. One negative: spinach tends to be more expensive BUT I find that I can stretch a package of spinach throughout several meals and I just don’t get that with lettuce. Both are really easy to grow if you can do that, so there’s that way of handling the whole cost issue. Still, even growing my own I would end up buying some occasionally because my small garden was not a farm that could keep up with my ridiculous family who likes to eat lots of spinach. You can use lettuce in veggie soup, and chiffonade it with peas.